Languedoc wine producer Domaines Paul Mas is at the London Wine Fair this week with a new range of sulphur free wines available in the UK for the first time. The largest privately-owned winery in France outside of Champagne, Domaines Paul Mas has long regarded the UK as one of its most important and dynamic markets. Paul Mas will be showcasing the 2015 vintage of the Cuvée Secrète red, a sulphite free blend of Merlot/Cabernet Franc, in addition to the 2015 Cuvée Secrète Chardonnay. "This year, we have been experimenting with low SO2 fermentation techniques and the results are convincing: the cuvées without sulphur taste far better than those to which sulphur has been used throughout the fermentation and they continue to develop in intensity," says owner Jean-Claude Mas. The winery is now leading the vanguard for sulphur free and low sulphite wines in the Languedoc; in 2015, the estate vinified around half of the total white win e volume and 25% of the red volume in this way. Harvesting at night to prevent grape oxidation and careful management of the fermentation process allows the producers to refrain from using any SO2 until right at the end of the vinification process, a method that Jean-Claude Mas eventually hopes to use for the entire production at Domaines Paul Mas. According to Mas: "The 2015 harvest, which was simply of exceptional quality, enabled us to further experiment with low and sulphite free wines, due to the outstanding quality of the fruit we picked. We are now convinced that sulphur, albeit a useful tool for preserving wines, is not essential and we are tending to use it as little as possible - a strategy which is paying dividends for our wines." The Cuvée Secrète range on display at the 2016 edition of the LWF also includes a Minervois La Liviniere and a Clairette du Languedoc, which is a little known AOP situated to the north of Pézénas in the Hérault Valley. The grape produces fresh, aromatic and fruit driven wines, an attractive cousin of the now trendy Picpoul de Pinet, making it an ideal summer aperitif and seafood pairing. Organic wines and sustainability are similarly important themes being promoted by Domaines Paul Mas this year. 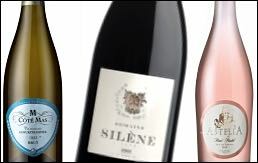 In 2015, Jean-Claude Mas purchased Domaine Silène des Peyrals in Herault, which boasts 24 hectares of organically managed vineyards that will complement the existing organic projects being implemented across Domaines Paul Mas. Jean-Claude Mas has also pioneered a range of high-quality, traditional method sparkling wines in the Languedoc, which represent exceptional value when pitched against Champagne. New arrivals include theCuvée Secrète Blanc de Blancs and Pinot Noir traditional Method. In addition, Domaines Paul Mas will unveil its Coté Mas Sparkling Gewürztraminer at the LWF, the first 100% Gewürztraminer sparkling wine to have been produced in the Languedoc. Mas comments: "Innovation, expansion and a constant need to push the boundaries of what is achievable in the Languedoc is at the heart of our company's philosophy. I'm excited to be showcasing such a wide variety of new wine styles at this year's LWF, including our delicious Astélia rosé, sulphite free wines and some new sparkling wine styles. In fact, I can safely say that visitors to this year's fairshould expect our most diverse offering to date."